The flesh of an apple is a nutritious and safe snack for a dog, but before you offer an apple to your dog, discard the core, stem and seeds. The core presents a choking hazard, and the seeds contain amygdalin, a compound that includes cyanide, which may cause stomach upset or more serious problems if your dog consumes too much. 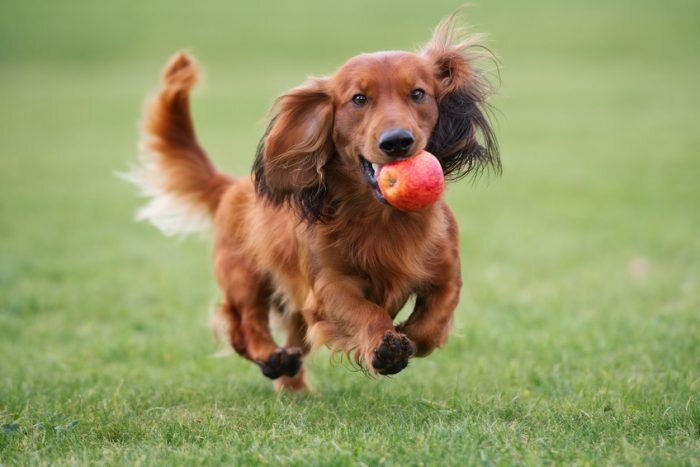 Apples contain vitamins A, K and C as well as calcium, phosphorus and both soluble and insoluble dietary fiber, so apples are super-healthy treats for your dog. Vitamin C is a well-known antioxidant that may help ward off certain diseases in animals as well as in people. Soluble fiber prevents cholesterol buildup in blood vessels, thus reducing the risk that arteriosclerosis or cardiac disease develops, while insoluble fiber enhances digestion by adding bulk and retaining water to speed the travel of food through the digestive tract. Apples are low in fat, sodium and protein, making them ideal treats for your dog if he must adhere to a restricted diet. Omega-3 and omega-6 fatty acids in apples help keep your dog’s skin and coat healthy. As a bonus, apples also help freshen your dog’s breath. Perhaps the easiest way to include apples in your dog’s diet is to cut an apple into slices and feed him fresh or frozen apple slices. (Leave the skin of the apple intact so that your dog receives the maximum amount of the available vitamin C and insoluble fiber.) Try placing apple slices into a Kong, which provides your dog with a challenge along with a healthy treat, or sprinkle grated apple over your dog’s regular food. Dehydrated apples are a possible option to feed your dog, but while they are just as nutritious as fresh apples, the lack of moisture may lead to stomach upset. It is best to feed your dog dehydrated apples in limited quantities. Homemade applesauce provides an easy way to add apple to your dog’s diet. Mix a spoonful into your dog’s food occasionally, or make frozen treats, such as applesauce pops or applesauce cubes. Store them in plastic bags for simple, no-fuss treats that you can use later. As is the case with any new food, start by offering your dog small quantities of apple to see how he reacts to it. Some dogs have difficulty digesting apples or exhibit other symptoms that indicate sensitivity, so start by offering one or two slices. Observe your dog for the next day or two, and note anything unusual. If your dog seems to tolerate those first apple offerings, it is most likely safe to continue offering occasional small servings of apple. The bulk of your dog’s diet normally consists of commercial or homemade dog food as recommended by your veterinarian. Servings of apple are acceptable as occasional snacks and in moderation but should not comprise the major part of your dog’s dietary intake. Stomach upset and diarrhea are the most common symptoms in dogs who eat too much apple. Withholding apples for a few days and then limiting intake corrects these issues. If your dog accidentally consumes a few apple seeds, he is unlikely to experience adverse effects, especially if he swallows the seeds without chewing them. Because apple seeds only release amygdalin, the toxic substance in apple seeds, when they are broken or chewed, small numbers of unchewed seeds are likely to pass through your dog’s system without causing any adverse effects. If you think your dog has ingested a number of apple seeds or has chewed on apple seeds, contact your veterinarian for advice. Check with your veterinarian before serving apple treats to your dog if the dog has a diagnosed medical condition. It may be necessary to monitor your dog’s intake of calcium, phosphorus and omega-6 if kidney disease is present, and arthritis necessitates monitoring of omega-6 fatty acid levels. Sugar levels in apples may be a concern when it comes to diseases such as cancer and diabetes.